I have long dreamed of going to France and Italy – taking cooking classes in some wonderful classic school, shopping in small villages with orange roofs, tasting the local wines while watching the sunset and biking through the countryside so that I can continue to eat and drink without suffering the usual consequences of such behavior. My long-time friend, Paula, and I have dreamt of this trip forever. Life has a way of altering plans, and, though we often talk of it, we have yet to take our journey. 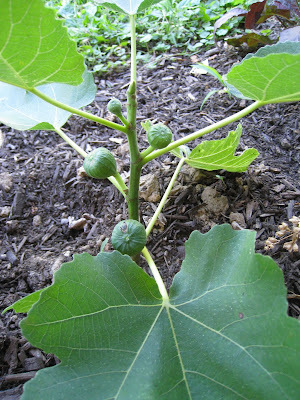 So I bike though beautiful Lancaster County, attend cooking classes here and there when I can, enjoy some wine at sunset on our porch and, this year, planted a fig tree. It’s my little bit of Italy and France in our inn’s backyard. my friend and owner, Kathy, warned me that not all fig trees will bear fruit. “It should be near a brick or stone building so that it can stay protected in the winter,” she told me. “It also needs the hot afternoon sun”. So I paid my money and took my chances. The tree seemed to thrive in our hot and dry summer – I wish I could say the same for my flowers. As if the beautiful leaves weren’t enough reward themselves, soon my little fig tree was growing and branching off. I cut off four branches, encouraging it to grow up straight. And, although tall wouldn’t be quite the word I’d pick to describe it, the tree did produce three figs. The first got a little brown spot on the bottom – maybe I didn’t pick it fast enough. This made me pay even closer attention. Soon the other two green figs were a nice lime color and “gave: a little when squeezed. I decided to harvest my crop early one morning and serve the bounty for breakfast. There was just enough for my guests. Though the portions were small, the warm, sweet fruit exploded with flavor. It was certainly a feast! The next challenge will be trying to get the tree to make it through the winter. Maybe someday I’ll even get to taste figs in France or Italy – perhaps topped with a little crème fraiche and toasted hazlenuts! Looks like you did a good job with this little tree over the summer. I suspect you will get it through the winter, too!